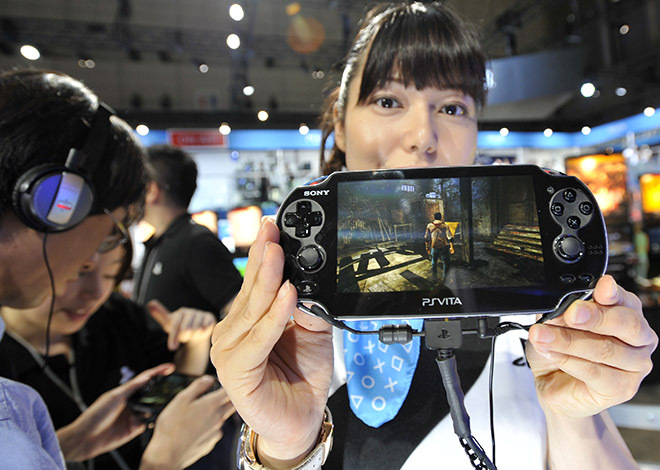 A Sony booth worker holds up a PlayStation Vita playing the Uncharted: Golden Abyss game at Tokyo Game Show Thursday afternoon. TOKYO and CHIBA, Japan — Wired.com’s staff came into Tokyo Game Show excited to get our hands on the PlayStation Vita. One endless bus ride, an aimless excursion on a boat and lots of polite rejections later, we were no closer than when we began. Sony is launching PlayStation Vita in Japan on December 17 with 26 games, many of which were in its booth on the Tokyo Game Show floor. But the extremely long wait times to play games usually put a crimp in any media outlet’s attempts at covering all of them. What game publishers usually do to ensure that we can write as much as possible is hold separate game preview events off the show floor. This is what Sony said it would do for Vita, but it didn’t turn out quite the way it was promised. All in all, I was only able to play three games — none of the new ones, but only games that we’d already covered at E3 months ago. During my initial tour of the show floor on the first “business day” of Tokyo Game Show, when the show is not yet open to the public, I noticed that there were already long lines for all the Vita units at the Sony booth. The only way to play a Vita was to stand in line for 50 to 70 minutes — per game. As things looked grim, Sony of America came to the rescue. I was invited to a special “Vita Media Event” taking place later that evening. The plan was to meet at a nearby hotel at 5:30 and take a shuttle bus to a nearby harbor. At 6:30 we would be on the water playing Vita, and by 9:30 we’d be on our way back to Tokyo. 6:30 to 9:30. In other words, a three-hour tour. That should have been my first clue. At 5:25, I sat in the lobby of the APA Hotel in Makuhari with dozens of foreign game journalists. It was my Twitter feed brought to life. Some had camera crews, others were still carrying bags of Tokyo Game Show souvenirs. All of us were sitting and wondering aloud when Sony representatives would welcome us onto the waiting buses. By 6:00 we were on the buses, but still idling outside the hotel. I worried about the delay, but according to the invitation the boats were “25 minutes” from the Makuhari Messe convention center. There was still plenty of time to get to the water by 6:30. One hour later, I became suspicious enough of the journey to tweet my dismay. Either our driver was lost, or he just felt that now was the best time to practice his three-point turns. In a bus. Contact with the second bus confirmed they had already disembarked and transferred to smaller vehicles. Where were we headed? 1up.com’s editor-in-chief Jeremy Parish had an inkling. At 7:30, we reached the drop-off point where the second bus had long ago dropped off its passengers. The site looked familiar, and at this point we all realized that we had passed these vehicles earlier only to return to them after our extended detour. We were beginning to think that we just could have walked it. Indeed, one fellow passenger had directed a friend to the boats using Google Maps. She got there before we did by taking the train and walking for half an hour. The boat that would be our nearly Vita-free prison. At 7:38 I see the boat. I expected we would just be walking around inside it playing games at our leisure. 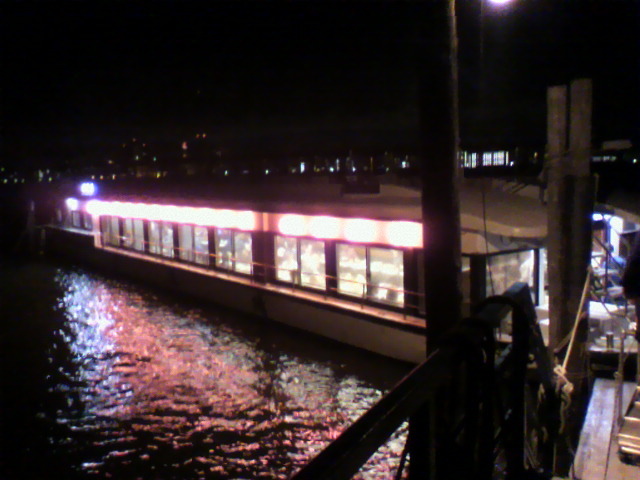 Instead, it was a floating dining room where half the guests were sitting with their backs to the wall. No walking. No standing. Just eating. We were supposed to have cast off an hour ago, and I was worried about the time. In my mind, I pictured a happy ending to the trip. Perhaps we would ride the boat long enough to eat our meal, then disembark at a hotel where piles of Vitas would await us? Then I could just hop on a train when I needed to go home. Content with my imaginary scenario, and with nothing to do but wait, I sat down and ate sashimi and tempura. Another hour passed without incident. I still hadn’t heard any news about our destination other than that we were going to Odaiba, an artificial island in Tokyo Bay. I could see Tokyo Tower outside the window of the boat. Were were we almost there? I began calculating which train was the latest I could possibly get on to make it back to my bed for the evening, because we clearly were not going to be finished by 9:30. Actually, it was already 9:30 when the boat finally stopped. In the middle of the water. Wearing our special boat slippers (all our shoes were in boxes downstairs), we were invited to go up to the roof to enjoy the view. It was suggested that Sony reps would bring Vita units upstairs. That was when it hit me: We’re not going anywhere. This is it. The Vita units had been here on the boat the entire time. But as the representatives started to pull them out, I saw that there were approximately six of them for a boat filled with over sixty members of the press. The first Vita I saw was exclusively showing a hands-off demo. I couldn’t even see what game it was, as a swarm of press crowded around and started filming it, some with their mobile phones. I asked a Sony representative if we could actually play with the Vitas. “Some of them,” was her nonchalant response. I went upstairs to see if I could find a Vita there. No. I came back downstairs and decided my best bet was to simply hover near the first Vita I could find. With a little luck, I might squeeze my way into landing some hands-on time.